BBC Three hasn't yet left the airwaves, yet the battle to claim its Freeview channel number is in full swing. Since the BBC first announced its proposals for BBC Three, local TV operators have been eyeing up the opportunity to move to a single channel number for the whole of the UK on Freeview. Currently, local TV stations appear on channel 8 in England and Northern Ireland and on channel 23 in Wales and Scotland, where STV currently operates two local services. Last week, The Guardian reported STV boss Rob Woodward as saying "It would make sense to have all the [local TV stations] across the UK on the same Freeview slot. BBC3 vacating its slot is the catalyst." He accused the BBC of wanting to swap one channel with another. The BBC's Market Impact Assessment, published in January as part of the BBC's original proposals regarding BBC One+1 and BBC Three stated it expected BBC One+1, if it had been given approval to launch, to appear lower down the EPG than BBC Three is currently. The Assessment made the assumption that BBC One+1 would launch on channel 23, and that local TV services in Scotland and Northern Ireland would move from channel 23 to channel 9. That would have meant BBC Four moving to channel 7, taking BBC Three's channel number. So there was never any question of the local TV stations in Scotland and Wales, currently on channel 23, being stopped from moving to a more prominent position after BBC Three TV is closed. Rather, the issue appears to be stopping the BBC from moving BBC Four to channel 7, a channel number that local TV operators want for themselves. Channel 8, even after the BBC Three changes remains used by Channel 4 in Wales and BBC Alba in Scotland, and so can't be used nationally. But could the BBC swap one channel for another? Digital UK, the organisation responsible for allocating Freeview channel numbers, currently allows commercial channel "families" to swap channel numbers and leapfrog other channels, if it means sister channels can be moved more closely together. Commercial broadcasters can under Digital UK rules swap their own channels between the channel numbers it occupies on Freeview. 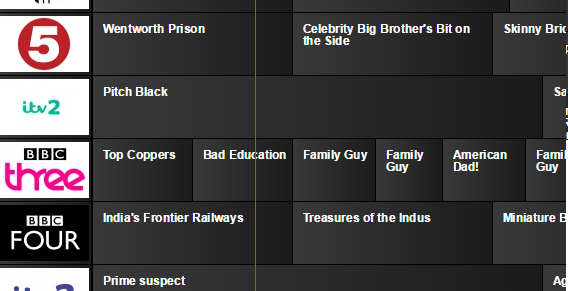 UKTV used this option when it swapped Dave and Yesterday (channels 12 and 19), and moved Really to channel 17 in 2012. Channel 4 did a similar move, when it moved More4 from channel 13 to channel 14 to create space for Channel 4+1. Earlier this year, Viacom's Channel 5 moved its channels around when Spike launched - moving 5USA from channel 31 to 21, parachuting Spike into channel 31 and moving VIVA down to the bottom of the channel list. ITV also made use of the rules moving ITV4+1 to channel 26 to bag the channel number for ITVBe last year. BBC channels come under section 310 of Communications Act 2003. Paragraph 7.6 of Digital UK's rules say they won't accept requests to swap channel numbers for channels that are covered by section 310. But they will adhere to Ofcom's EPG code when giving prominence to such channels. This provides flexibility to allow BBC Four to move to channel 7 when BBC Three TV is closed, although both Channel 4 and BBC Alba could also legitimately shuffle up to channel 7 after BBC Three goes off-air, keeping local TV on channel 8 - but this time also in Scotland and Wales - and BBC Four on channel 9. Channel 23 could then be reallocated to another service. In the meantime, local TV operators such as STV continue to lobby Ofcom and Digital UK in their effort to bag a better channel number from 2016. 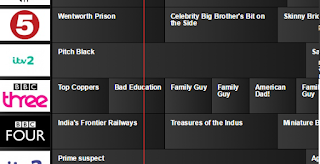 Meanwhile, BBC Three HD closing down on channel 105 would provide Channel 5 HD an opportunity to make its long-awaited appearance on Freeview to bag what is the most logical channel number for the channel on the platform. Separate from the fight over BBC Three's channel number is what will happen to BBC Three's current broadcast spectrum or the bandwidth currently used to carry BBC Three and BBC Three HD on Freeview. The BBC wants to take the first two hours from BBC Three's current allocation to allow CBBC to broadcast until 9pm, leaving the bandwidth currently used by both BBC Three and BBC Three HD beyond 9pm in doubt. The BBC says it's exploring various options, but won't comment any further at this stage. It would be crazy if Channel 5 did not bag this Number as both Sky and Freesat have crazy numbers for HD channels at the moment especially in UK (how crazy is it for the prestige main 4 stations to be so split up (BBC 1 - 141 BBC2 - 102 ITV - 178 CH4 227) It is a great opportunity for them to acquire what should logically be theirs even if they are locked into an agreement with Sky at the moment they could use it for a different FTA channel say temporarily putting something like Spike HD even if it is only up-scaled just to "hold" the number. I agree re channel 5 HD on free view its about time even if they have to squat like you say. As regards BBC Four I think it should go on channel 7 the BBC should get first dibs as they are the first public broadcaster, always have been and I hope always will be (in the UK). If local TV want to have all local channels on the same number they could move to freeveiw channel 9 in England and Northern Ireland and let 8 just be for BBC Alba and Channel 4 in Wales. It actually won't make much difference on people's EPGs anyway. Everyone agrees that the current EPG is a bit of a mess generally, but in this specific case at least there are some quite easy solutions on offer. Moving Channel 4 and BBC Alba to 7 then having all Local TV on 8 would benefit everyone involved – for one thing, the Local TV channels already on channel 8 won't need to update programming or marketing materials. The knock-on effects this would have further up the guide at 23... well that's a whole different issue altogether! Would it be ITV who get first dibs on 23 due to it being next to ITV4 on 24? The BBC Own the channel at the moment so it should be up to The BBC to decide what happens to it.......I Think Thats Fair Game!!!!?????? The most relevant part of Digital UK's policy is section 5.5: "Where a lower LCN number becomes available within a genre than that which is assigned to a public service channel, Digital UK will offer the lower vacated LCN to the public service channel at the next lowest LCN before considering any other claims on the vacated LCN under any other section of this Policy." That would move the current occupants of 8 down to 7 as they're all PSBs. BBC Four would then move down to 8. 9 could possibly go to Channel 4+1 if you consider that a time-delayed PSB channel is still the same content so should also be considered PSB. However, C4+1 is licensed under the Digital Television Programme Service regulations, not as part of C4's PSB licence, which may - ridiculously - not count. That would allow the Scottish and Welsh local TV services to move to 9. 23 would then be offered to Ideal World under section 8.2, which governs vacated LCNs. I wouldn't expect Ideal World to take it, so ITV would then be offered it, since ITV4 is currently at 24, and they will probably move a channel. I'm going to stop there as predicting which one ITV would move is hard. 105 is easier: under either 5.5 or 8.2, BBC Four HD moves to 105 and BBC News HD to 106. Then under 8.2, Al Jazeera has no associated channels so can't move, and C4 could move 4Seven HD to 106 (then swap with C4+1 HD). QVC can then move one of their channels to 110. It should be noted that Ofcom is seeking due prominence to be applied to C4's offshoot channels as well. The issue of 105 being allocated to C5 HD if it launched on Freeview on the grounds of how 101-104 were allocated has already been brought up by Channel 5. Might keep Ofcom busy. I would settle for a channel showing some decent TV. Sick of all the shovelware at the moment. It's sad that BBC3 moved online. It should have been BBC4 instead. Why does the Beeb need so many digital channels? They can't bring decent programmes to the ones we already pay for. I would rather one decent Channel than rubbish spread over 3 or 4. It's my opinion. Why the hell would anyone want channel5 HD? We don't even want standard channel5 with its mix of propaganda and hate fuelling documentaries posing as reality tv. It's currently a cesspit. No give us ITV3 instead.